The Flint Firebirds had quite the year last season, and not for the right reasons. 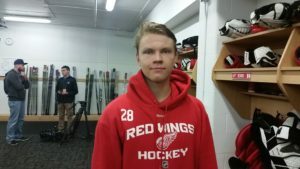 One member of the team was Detroit Red Wings defensive prospect Vili Saarijarvi (2015, third round, 73rd overall). As an 18-year old, he was able to overcome the drama surrounding the team’s management to produce 43 points in 59 games. The Firebirds, of course, finished last in their division. 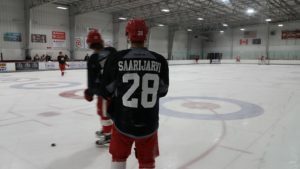 Saarijarvi was then traded to Mississauga, where he will play next season. This interview took place during the Red Wings’ annual prospect development camp in Traverse City on July 7th, 2016. Obviously last year with Flint, a little bit of a controversy there, just describe the roller coaster season you had there with the player walkout etc. I think, it was a great year. What happened happened, it’s in the past now. I think what we did was right, but like I said it’s in the past now. We had a great team, a great group of guys and everything was great in Flint. I had a good year there and I enjoyed good fans, everything was nice there and I didn’t have any problems, so it was good. Looking at the scoresheet, it was a pretty good year offensively for you. Was it hard to put aside all the off-ice stuff that was happening and just focus on playing? Obviously it got a little harder, but the big thing for me was just to stay positive and control what you can control. That was a big thing for me. We had a good [group] there of coaches, billet families, and my family back home and friends, so I think I didn’t have any problems with that, it was fun. You had a little taste of the ECHL with Toledo last season. What was that like? It was good. Everyone was very nice guys. We played five games, and they were all good games. I think we lost one game, and I think it went well and it was a great experience for sure. Now next season you’re probably going to start off with Mississauga (Steelheads of the OHL). Do you know anything about the organization going in? Yeah, I’ve been talking to the GM there, James Boyd. I talked to him, and then I’ve talked to the head coach too. I’m excited. I’m looking forward to going there. I know there are a lot of skilled players. I think we’re going to have a good year, a fun year. Seeing a lot of players here make that jump from Juniors to the American Hockey League, do you get that added push four your game, that you want to try to make the Griffins? Yeah, for sure, that’s a big thing. I want to play best I can here and work as hard as I can and make it hard for them to send me back to Juniors. But if they do, I’m happy with it. If they send me back, like I said, I’m excited to go there. But, my goal is to play in the NHL someday, so I want to take the next step too. What was the experience like playing on the Finnish World Junior team? It was great. The tournament was home in Finland, Helsinki, and we won the tournament, so it was something that I’ll never forget. It was great experience. It was another step in my career too. Just being part of the team was a big thing for me. What do you think the international stage adds to your game, just competing with the best young players from other countries? I mean, tournaments in Europe, usually we play on bigger ice, so it kind of gives you more space, but then on the other side too it gives, when you’re defense, you have to be more working and get the space out of forwards. You know, there’s good things that helps you, but then there’s things that makes it harder. Now it’s your second camp here. 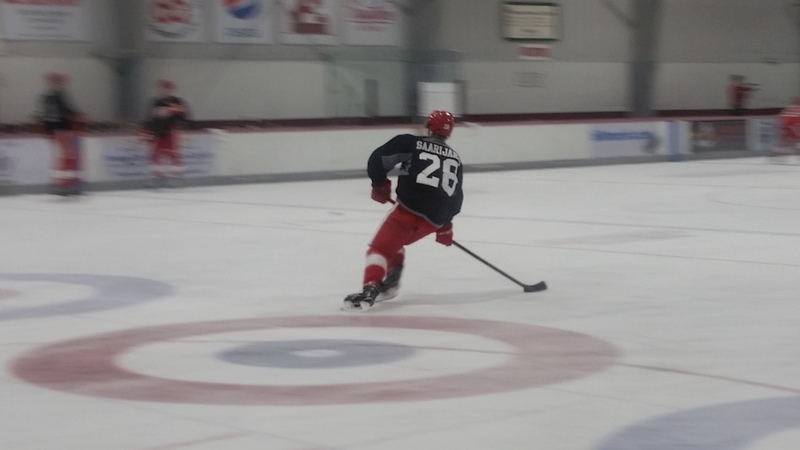 Is it easier with the familiarity of Traverse City and the rink and a lot of the people here? Yeah, for sure. You know, here now I pretty much know all of the coaches now, from last year’s camp, and all the other stuff here now. A lot of players were here last year too, so it’s a lot more comfortable this year. It’s been great. Is there anything new that you think you can take away from this camp that maybe you didn’t last year? Last year I was maybe more, like nervous, and stuff like that. So now I can be more like calmed down. It’s maybe easier to do everything, so then it gives a lot more open doors to enjoy this camp and enjoy the group of guys here and get to know everyone better. Lastly, what are your offseason goals? What do you hope to work on in your game? I want to add some size and go to the gym every day. That’s a big thing. And obviously get stronger. That’s going to help me in the future. And the stronger I get, it’s going to just help my game. But I think too that I want to further my skills and speed.